Left side of the revolver features a portrait of John B. Armstrong, who opposed bandits and gunmen with a singular passion, and is credited for capturing the infamous John Wesley Hardin. The cylinder displays a Ranger standing with a Winchester rifle and a revolver in his gun belt, a fascinating image from the early days of photography on the frontier. Their duties were not glamorous. There were no ironed uniforms, no handbooks, no boundaries, few regulations, and they were often unpaid. But a wild frontier called for more than ordinary law enforcement; it called for the Texas Rangers. The legend of the Texas Rangers begins almost 200 years ago, when America was rapidly expanding westward toward the Pacific Ocean. The land in-between was raw and dangerous. Those who chose to settle there needed a special kind of protection. Stephen Austin, known as “The Father of Texas,” made the call in 1823 for ten men “to act as rangers for the common defense.” Little did he know that his humble request would help create one of the most legendary forces in American law enforcement. They were tough, resourceful, independent, and fearless. They protected settlers from murderous gunslingers, cattle rustlers, and marauding bandits -- they were frontier warriors of the firmest resolve. Individually, the Texas Rangers were some of the most colorful heroes in American history. Their story is as American as the Old West, as heroic as the fight for land, as dangerous and wild as the expanding frontier. The Texas Ranger Tribute Schofield Revolver is issued on a firearm rooted in the days of the Old West: the top-break Schofield revolver, based on the original Schofield designed by Major George Schofield for the cavalry with Smith & Wesson. The right side of the revolver features a close-up portrait of Captain Leander McNelly, the no-nonsense leader of a force that patrolled the Texas-Mexico border, catching outlaws and cattle thieves. On the cylinder, you’ll find a group portrait of members of the Texas Rangers Frontier Battalion. Along the barrel is a famous quote from John S. “Rip” Ford, one of the toughest fighting men of the Mexican War and a legendary Ranger: “They Knew Their Duty and They Did It.” The revolver features an overall mirrored blue finish, with highly polished walnut grips. The backstrap features the official logo of the Texas Rangers Hall of Fame and Museum, located in Waco Texas, as well as a banner with your individualized edition number out of 500. "A Classic Old-West Firearm Honoring America’s Ultimate Old-West Lawmen"
The Texas Ranger Tribute Schofield Revolver is issued on a working revolver in caliber .44-40 (.44 W.C.F), a beautifully engineered firearm with a rich history. The Schofield Revolver was carried by some Texas Rangers, as well as legendary Old West figures like Buffalo Bill Cody, Frank and Jesse James, and Texas Jack Omohundro. The revolver took its name from Major George W. Schofield of the 10th Cavalry. Around 1870 he wrote to Smith & Wesson requesting one of their then-new “Model No. 3” revolvers, in the hopes it would prove useful in battle. Schofield made modifications to the revolver, including moving the release latch from the barrel to the frame. In 1875, Smith & Wesson incorporated these refinements into a design they named after the Major. The Ordnance Board granted Smith & Wesson a contract for Schofields, providing they could make the revolvers work with the .45 Colt ammunition already in use. Smith & Wesson instead developed their own, slightly shorter .45 caliber round for the military order. When the two cartridges would not work interchangeably in the Schofield and the Colt, the U.S. Government dropped the Schofield and continued with the Colt. Each Texas Ranger Tribute Schofield Revolver in this limited edition of 500 is a working Top-Break Schofield Revolver, available exclusively from America Remembers. We will arrange delivery of your working Tribute revolver through the licensed firearms dealer of your choice. As always, you will receive your Tribute with our 30-day guarantee of satisfaction. If you are not completely satisfied, you may return your Tribute to us in original, unfired condition for a complete and courteous refund. The legacy of the Texas Rangers, America’s ultimate frontier lawmen, lives on in the Texas Ranger Tribute Schofield Revolver. Now is your chance to own an enduring testament to their colorful story. Add one to your collection and preserve the memory of these legendary lawmen of the Old West on a classic Old West firearm. An optional, luxuriously lined, custom-built wooden display case with locking glass lid is available for purchase to protect your Tribute. Add $149. Licensed by the Texas Ranger Hall of Fame and Museum, Waco, Texas. Official Historical Center of the Texas Rangers. to Order from America Remembers. Texas Ranger Hall of Fame and Museum. The Texas Ranger Frontier Battalion Tribute Schofield Revolver is a working revolver. "It's easy to see a graveyard in the muzzle of a Ranger's gun..."
The Texas Rangers have a reputation as huge as Texas and as wild as the open frontier they helped tame. They embody the rugged spirit, loyalty, and resourcefulness that defines Texas as much as it defines America. From wide-open territory to independent Republic to America's twenty-eighth state, the Texas Rangers are true Lone Star heroes. Legendary for their courage and bravery during the chaos of the changing frontier, the Texas Rangers are the oldest statewide law enforcement agency in America. The Rangers trace their roots back to 1823, when Stephen F. Austin, "The Father of Texas", wanted to provide protection for the first settlers in the region. His "rangers" would aid the small Texas militia already in place to protect settlers from criminals and hostile Indians. With their own horses and rifles, Texas Rangers protected the frontier and its new settlers from danger. They had to be mentally and physically tough enough to handle life alone on the trail. In 1874, Governor Richard Coke organized the Frontier Battalion: six companies of Texas Rangers. Seventy-five men comprised each company: A, B, C, D, E, and F. The Frontier Battalion is often called the "first permanent Texas Rangers." These Rangers were lawmen who took matters into their own hands. The lawlessness and danger that followed the Civil War made the presence of the Frontier Battalion extremely necessary. They tracked down murderers and outlaws. They arrested stage and train robbers, cattle thieves and fence cutters. They maintained peace along the border. Their jurisdiction spanned all of Texas. Their jurisdiction covered more square miles than some countries. Working in cooperation with the Texas Ranger Hall of Fame and Museum in Waco, Texas, America Remembers proudly presents the Texas Rangers Frontier Battalion Tribute Rifle, an exciting issue honoring the legendary lawmen of the Texas frontier. For this Tribute, we selected the classic Winchester Repeating Arms Model '73 rifle in caliber .45LC, arguably the most famous of all Old West rifles. The rifle features a 24" octagonal barrel, a favorite of collectors. Each rifle is decorated by craftsmen commissioned specifically for this project by America Remembers in elegant 24-karat gold and nickel. Winchester discontinued production of the Model '73 rifles in the early 1900s but they recently reintroduced this Old West classic, and demand is extremely strong. Act quickly in placing your reservation for one of these exclusive Texas Rangers Frontier Battalion Tributes. Tough and resourceful, the Texas Rangers of the Frontier Battalion patrolled the wide-open frontier of Texas for weeks and months at a time, often living off the land and navigating without maps. Judges and sheriffs throughout Texas recognized the importance of the Rangers. County Judge B. Campbell of McCulloch County once reported: "The rangers are the only officers that have had any success in arresting desperate characters and bringing them to justice." County sheriff, H.T. Eubank added, "It is my firm conviction, if it had not been for the Frontier Battalion, this county would have been overrun with desperados and fugitives from justice, to say nothing of the Indians." During these times of unpredictably, a Texas Ranger had few things he could trust - but he always had his firearm. Detail: Centered on the left side of the receiver, is a legendary image of Company D Rangers, rifles in hand. Framing this artwork is the Texas Ranger Hall of Fame and Museum logo and a Texas Ranger star, all featured under an elegant banner reading, "Texas Rangers Frontier Battalion." To the left of this artwork you"ll find an image of five Frontier Battalion Rangers and a child. On the far right you'll find Captain Bill McDonald, an outstanding marksman, and Captain of the Texas Ranger Company B Frontier Battalion from 1891 through the early 1900s.One of the most famous lines attributed to Captain McDonald is: "No man in the wrong can stand up against a fellow that's in the right and keeps on a-comin'." When Coke established this Frontier Battalion, the finest lever-action rifle available was the Winchester Model 1873 rifle. We felt it was the perfect firearm to honor the unique and celebrated history of these legendary Texas Rangers of the Frontier Battalion. The Winchester Model '73 was so popular on the Western frontier, it is often referred to as "The Rifle That Won The West." With its rapid-fire repeating capabilities, it was a favorite for Rangers of the Frontier Battalion. The Model '73 was the latest in a long line of innovative creations from the Winchester Repeating Arms Company, building on the successful design of the Model '66, which in turn had been an improvement over the legendary Henry Rifle. Advertisements proudly proclaimed that the Model '73 was capable of being "fired thirty times a minute continuously as a repeater," was simple to operate, and offered quick and plentiful firepower. The Model '73 in the hands of fearless and determined Texas Rangers brought law and order to the wild frontier, where settlers faced dangers of cattle rustlers, marauding bandits, and murderous gunslingers. In the late 1800s the Winchester '73 ranked among the most reliable and beloved weapons of the day for the Rangers. Today, the Winchester '73 continues to captivate collectors and firearms enthusiasts alike, and it remains one of the most admired and collected firearms from the Old West era. Detail: The right side of the receiver features a group of Texas Rangers settling down for a meal. With their rifles beside them and their horses behind them, Rangers were always prepared to act quickly. To the left is an image of celebrated Texas Ranger Ira Aten, a member of the Frontier Battalion Company D who was inducted into the Texas Rangers Hall of Fame and applauded for his efforts to curb fence cutters and cattle rustlers on the Texas frontier. On the far right, four Texas Rangers pose for a photograph with their trusted rifles. Elegant scrollwork frames all the artwork on both sides of the receiver. The Texas Ranger Frontier Battalion Tribute Winchester rifle is a working rifle. During the untamed years of the Wild West, the Texas Rangers rode as lone defenders of justice. They were often the only protection on the frontier for settlers facing hostile Indians, cattle rustlers, bandits and gunslingers. And time after time, the men with the badges proved worthy of every challenge. Their exploits made the Rangers one of the most famous and respected crime-fighting forces anywhere in the world. As the nation entered the 20th century, the state of Texas found itself on the frontlines of a Mexican revolution, a surge in bootlegging and a population boom sparked by the discovery of oil. The Rangers faced new breeds of criminal and new kinds of crime. But with the same courage and discipline that served them on the frontier, justice triumphed and the Texas Rangers secured their legacy as true American heroes. Now America Remembers is pleased to announce an exclusive new Tribute honoring the unequaled bravery and dedication of the Texas Rangers: The Texas Ranger Tribute Thompson. This exciting new issue is the first time America Remembers has celebrated the Ranger legacy with a handsomely decorated, working Thompson Semi-Automatic submachine gun. Craftsmen commissioned specifically for this project decorate each working Thompson in sparkling 24-karat gold and nickel with a blackened patinated background to highlight the details of the artwork. Not only is the Texas Ranger Tribute Thompson available exclusively from America Remembers, it is also being offered in cooperation with the Texas Ranger Hall of Fame and Museum in Waco, Texas. For more than 40 years, their mission has been to honor distinguished Texas Rangers, and Rangers who have given their lives in the service of the people of Texas. They continue to promote, among present and future generations, a pride and interest in the Texas Rangers and the heritage of the American West. "On the Side of Law and Order"
In 1915, as the brutal fighting of World War I raged, retired Army General John T. Thompson began research on a weapon that would put more firepower in the hands of Allied men on the frontlines. But the first Thompson submachine gun prototypes weren’t ready to ship until November 11, 1918… the day the Great War ended. In the absence of a global conflict, the Thompson was immediately touted as the ultimate crime fighting tool. It was described as an ideal weapon for the protection of large estates, ranches and plantations, which was certainly appealing to the Rangers, whose jurisdiction spread out for hundreds of miles in every direction. The promises of the Thompson being “simple, safe, sturdy and sure in action” proved true, allowing it to secure a distinctive history with the Texas Rangers in their brave efforts to uphold law and order. To this day the Thompson remains one of the most widely recognized and respected firearms in the world. Only 300 Texas Ranger Tribute Thompsons will be issued in this strictly limited edition available exclusively through America Remembers. The distinguished history of the Texas Rangers has been more than 175 years in the making. Don’t miss your opportunity to own a classic American firearm honoring the contribution of these unwavering American heroes, who fought to preserve law and order in the Lone Star State. Reservations for the Texas Ranger Tribute Thompson will be accepted in the order they are received. We will arrange delivery of your working Thompson through a licensed firearms dealer of your choice. And, as always, if you are not completely satisfied with your Tribute after personal inspection, you may return it in original, unfired condition within thirty days for a complete and courteous refund. The Texas Ranger Tribute Thompson proudly honors the courage, sacrifice and service of these true legends of United States law enforcement. This is your chance to own a piece of Texas history, a piece of American history and an enduring testament to the strength and integrity of those who sacrificed all to preserve law and order. Left side features a Ranger sitting atop his horse. For the Texas Rangers, horses were absolutely necessary for covering the wide expanses of land that made up the Lone Star State. The central image depicts a proud Texas Ranger posing alongside a trio of confiscated liquor stills. Alongside, a banner reads, “Prohibition” and “Gambling,” two of the greatest problems for the Rangers during the early decades of the 20th century. Prominently featured is a heroic portrait of Captain Manuel “Lone Wolf” Gonzaullas beside a flowing banner bearing his name. A legend among the Rangers, Gonzaullas earned his reputation for acting much like a one-man army against the rampant crime spree in the 1920s and 30s. Right side features two Rangers pictured beside an official Ranger car and horse trailer, which both stand as fitting symbols of the two historic eras policed by the Rangers. Featured across the center is a sweeping banner reading, “Texas Rangers” and “They Knew Their Duty and They Did It,” separated by the iconic “star in a wheel” badge design. This famous quote comes from John S. “Rip” Ford, a legendary Ranger. Behind the banner, a field of oil derricks sprouts up like a city skyline. Also featured is a block of building fronts that represent the typical Texas boomtown. On the far right a group of five Rangers is featured standing at the ready with their weapons of choice, including a couple Thompsons. All artwork is featured in 24-karat gold and nickel with a blackened patinated background. The Texas Ranger Thompson is a working Semi-Automatic rifle. "Their enemies were pretty good... The Rangers had to be better." America Remembers is especially pleased to announce an exclusive new Tribute honoring the rich history of the Texas Rangers: The Texas Ranger Tribute Colt .45 Pistol. This exciting new Tribute is issued exclusively through America Remembers and in cooperation with the Texas Ranger Hall of Fame and Museum in Waco, TX, a center dedicated to preserving the rich heritage of the Texas Rangers. It is also the first time we have celebrated the Texas Ranger legacy with a handsomely decorated, working Colt® Government Model® Pistol in caliber .45 ACP. Craftsmen commissioned specifically for this project by America Remembers decorate each working Tribute in sparkling 24-karat gold and nickel artwork over a handsome blued steel background. When Colt released the Model 1911 .45 pistol for the U.S. Army, it was embraced immediately by the Texas Rangers and proved a perfect fit. Developed by legendary gun maker John Moses Browning, the Colt .45 has become one of the most trusted sidearms of American military and law enforcement. Durable, powerful and easy to maintain, the Colt .45 proved itself reliable and trustworthy. And for the last century, many Texas Rangers have depended on this powerful .45 pistol in their continuing war on crime. 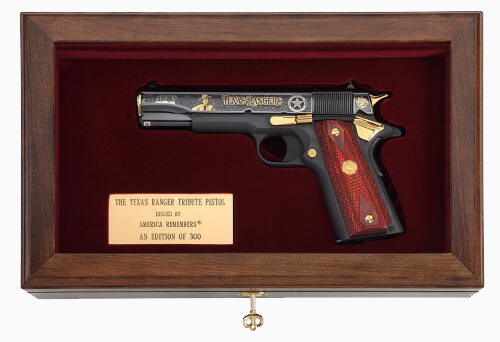 Only 300 Texas Ranger Tribute Pistols will be issued in this strictly limited edition. Reservations will be accepted in the order they are received. We will arrange shipment of your Tribute through the licensed firearms dealer of your choice. And, as always, if you are not satisfied with your Tribute, you may return it within 30-days in original condition for a complete and courteous refund. Left side features a heroic, 24-karat gold portrait of Captain Manuel “Lone Wolf” Gonzaullas. A legend among the Rangers, Gonzaullas earned his reputation (and nickname) for acting much like a one-man army against the rampant criminal activity in the 1920s and 30s. Prominently featured in the center of each side of the slide in stunning 24-karat gold are the words, “Texas Rangers.” Near the muzzle end on each side is a sprawling field of brushed nickel oil derricks, sprouting up like a city skyline. The Tribute features handsome 24-karat gold decorations, including the hammer, slide stop, safety lock, grip screws, barrel bushing and magazine catch. Complementing the overall design are the handsome rosewood grips checkered in the classic “double diamond” pattern. Right features a banner that reads, “They Knew Their Duty And They Did It,” a famous quote from John S. “Rip” Ford, a Ranger legend. Also featured is a row of Texas Rangers posing in front of barrels of confiscated bootleg liquor, representing their legendary fight against crime during the Prohibition Era of the 1920s. The Texas Ranger Tribute Pistol is a working firearm. The Following Issues Have Sold Out -- Thank you for Your Support! History is filled with accounts of legendary Texas Rangers who brought law and order to towns torn by blood feuds, and Rangers who fought bravely against bands of outlaws and Indian war parties to protect the citizens of Texas. Time and again, they proved that one person in the right could triumph over even the greatest odds. "They Knew Their Duty and They Did It." On the recoil shield is the official logo of the Texas Ranger Hall of Fame and Museum in Waco, Texas, which houses a spectacular collection of Texas Ranger artifacts and is dedicated to preserving the Texas Ranger heritage for future generations. The cylinder features portraits of six legendary Texas Rangers......Maj. John Jones, Capt. Leander McNelly, Sgt. John B. Armstrong, Capt. Bill McDonald, Capt. Dan Roberts, Sgt. James B. Gillett. 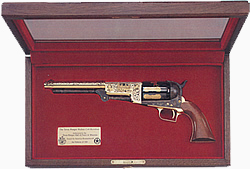 A display case accompanies each Tribute, lined in velvet contoured to fit the revolver, and features a brass plaque identifying this Tribute as officially authorized by the Texas Ranger Hall of Fame and Museum. Our Tribute revolver, crafted of modern, high-strength steel by Colt Blackpowder Arms Company, is an accurate--and shootable--reproduction of the rare 19th century original, officially authorized by the Texas Ranger Hall of Fame and Museum in Waco, Texas. Each revolver is decorated with artwork in 24-karat gold by craftsmen commissioned by America Remembers. The unfluted cylinder features W.L. Ormsby's original engraving, highlighted in gold, depicting a battle in which a small band of Rangers, armed with Colt Patersons, easily defeated a far larger group of Comanche raiders. Etched in 24-karat gold on the left side of the barrel are the legendary Rangers Samuel Walker and John Coffee Hays, flanking a detailed group photograph dating from the late 1800's. On the right side are shown William W. "Big Foot" Wallace and W.J. "Bill" McDonald, who is credited with the Ranger motto, "No man in the wrong can stand up against a fellow that's in the right and keeps on a-comin." An ardent supporter of Colt's "repeaters," McCulloch was widely regarded as one of the two most fearless men on the Texas frontier. The other was Ranger Jack Hays, another great Colt enthusiast. This much is certain: the earliest surviving inscribed presentation Colt is Ben McCulloch's Transition Dragoon, serial number 1337. Ranger McCulloch carried his cherished Colt for the remaining 13 years of his life. During the Civil War it was with him. At the Battle of Pea Ridge, he died from a sniper's bullet. Then it mysteriously vanished. Texas Rangers have served Texans since the earliest days, and the history of the Rangers is legendary. Stories of their courage and daring are world-renowned. In 1823, famed Texan Stephen F. Austin proposed to employ "rangers" to protect settlers from hostile Indians and the criminal element. Today, 175 years later, the Rangers continue to protect the citizens of Texas. Working in cooperation with the Texas Ranger Hall of Fame and Museum in Waco, Texas, America Remembers proudly announces the Texas Rangers 175th Anniversary Tribute Rifle. For the Tribute, we selected the classic Model 94 Winchester rifle in caliber .30-30, a rifle that was a favorite of the Rangers. Each Tribute is elegantly decorated by craftsmen commissioned specifically for this issue by America Remembers. From the gold and nickel embellished receiver on the blackened background to the handsome laser-carved stocks, the Tribute captures 175 years of Ranger history in magnificent detail. Working in cooperation with the Texas Ranger Hall of Fame and Museum in Waco, Texas, America Remembers proudly announces the Texas Rangers 175th Anniversary Tribute Rifle. For the Tribute, we selected the classic Model 94 Winchester rifle in caliber .30-30, a rifle that was a favorite of the Rangers. The Texas Ranger Hall of Fame and Museum has licensed this classic lever action carbine rifle modeled on the Winchester 1873 carbine in caliber .44-40 made by master craftsmen A. Uberti. This type of carbine was carried by Ranger Sgt. James B. Gillett. It features a blued 20" barrel, optimal for use on horseback. The receiver, lever and other parts are decorated with 24 kt. 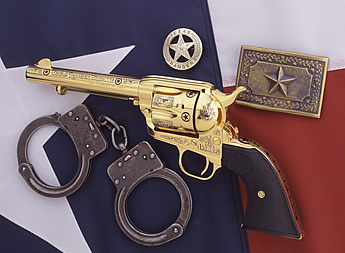 gold and engraved with artwork honoring the Texas Ranger heritage.